I am taking home a 3 month old baby Pomeranian with a fungal infection, which was just explained to me. The women doesn't know what kind but says she has been giving the baby shampoo baths and medications. It has the signs of Blastomycosis. I have 2 dogs right now. I want to give this baby a home. Are these signs of "don't do it" find another dog? And!!! Is this a common thing for a baby dog to get? The house that the baby dog is living in has 20 dogs, 5 cats, 2 large tropical birds, and fish tanks everywhere. I think blastomycosis is an unlikely diagnosis in a 3 month old dog, particularly if the only symptom the dog has are skin lesions. Most dogs with blastomycosis have some combination of poor appetite, weight loss, coughing, difficulty breathing, limping, eye problems, skin lesions (particularly around the toenails), enlarged lymph nodes, and fever. 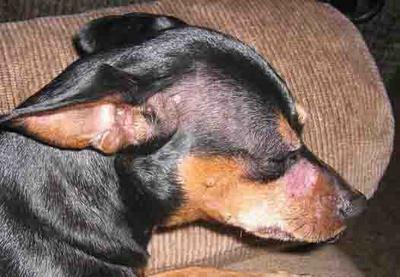 Other types of fungal infections of the skin are very common in young dogs, particularly dermatophytosis (commonly called ringworm) and Malasezzia, a type of yeast. It sounds as if this puppy does not yet have a definitive diagnosis. Would it be possible for you to take him or her to a veterinarian before committing to giving her a permanent home? That way you would have an idea what you are getting into. Reputable breeders offer a type of “return policy” if a veterinarian finds something seriously amiss soon after a puppy is purchased, so this is not at all an unreasonable request. Join in and write your own page! It's easy to do. How? Simply click here to return to Ringworm and Fungal Infections.